Should I Call a Panic Helpline? Panic attack hotlines are an excellent resource for people struggling with anxiety disorders. Panic attacks can happen anywhere at any time. If you have an anxiety disorder or have experienced a panic attack, then you understand how frightening the experience can be. Too many people end up avoiding some of the best things life has to offer because they are afraid of being struck by another attack. But living in fear of the next attack is no way to go through life. Your anxiety disorder is treatable; learning to manage it effectively will help prevent panic attacks before they start. A panic hotline is a great place to discuss symptoms and learn more about the different types of treatment available. Difficulty breathing, shortness of breath, choking or smothering feeling. Understanding Anxiety Anxiety is a human emotion. Everyone experiences it. Yet, each person experiences this emotion in unique ways. One of the most awful characteristics of panic disorder is that it doesn’t end when the panic attack ends. You might continue to replay the episode in your head, remembering how painful and terrifying it was. This might lead you to avoid places where you experienced panic attacks in the past or activities you were engaging in when symptoms began. Panic attacks are often accompanied by other mental health problems. Many people who suffer from panic attacks are also dealing with other anxiety disorders, or other mental health issues such as depression or post-traumatic stress disorder (PTSD). Substance abuse problems are also common among people who get panic attacks, often because they are trying to self-medicate. Depression and anxiety are serious issues that require immediate help. If you are having a panic attack and worried that you might hurt yourself or someone else, you should call 911 immediately. Similarly, if you are concerned about the immediate safety of a friend or family member, 911 is the best resource for immediate help. If you have a friend or loved one who is struggling with anxiety, panic disorder hotlines can be a valuable resource for you to ask questions and learn more about anxiety and panic disorders. Most panic attack helplines are free and confidential, which makes them an excellent way to reach out for help. It is normal to feel hesitant about asking for help, especially if you’re unsure that what you are experiencing is truly a panic attack. But the people who staff panic attack hotlines are sympathetic and nonjudgmental. Their job is to provide people like you with the information and resources you need to get better. If you have a friend or loved one who is struggling with anxiety, panic disorder hotlines can be a valuable resource for you to ask questions and learn more about anxiety and panic disorders. Many people call panic helplines because they are worried about someone they love, but they don’t know exactly what is wrong. To learn more about panic attacks and common symptoms. To talk to someone who understands what is happening. To find confidential and anonymous help. To locate a counselor or therapist. To find a mental health treatment center. To learn about preventing and treating panic attacks. To learn how to help someone during a panic attack. Calling a panic disorder hotline is a great way to get all your questions about panic attacks and other mental health issues answered. Everyone experiences stress and anxiety from time to time, so it can be difficult to understand what makes a panic disorder different from regular, healthy emotions. The staff at panic helplines are available to explain these differences to you. You can ask questions in a compassionate and anonymous setting. How do I know if I have panic disorder? What do I do if I’m having a panic attack? What causes a panic attack? Can panic attacks be treated? What are the symptoms of panic attacks? What if I have other mental health issues? What if I am using drugs or alcohol? Will I need to go to a special treatment program? How much does treatment cost? Will my insurance cover it? What are the next steps I should take? Watching a loved one suffer is extremely hard, especially if you don’t understand why it’s happening. Maybe you have seen your child get so overwhelmed with fear that he or she has trouble breathing. Maybe you’ve accompanied your partner to the emergency room after he or she was suddenly stricken with chest pain. Or maybe you have a friend who needs to drink or use drugs in order to feel safe in social situations. How can I help a loved one who is experiencing panic attacks? What resources are available for family members of people with panic attacks? Should I talk to the person about their panic attacks? What should I do if I think they’re in danger of hurting themselves or someone else? How do I talk to my loved one about the panic attacks and show my support? How can I help my loved one find treatment? Will these panic attacks ever go away? Panic disorders are more common in women than men. They typically begin in young adulthood but can also be triggered by stress later in life. It is normal for people to experience episodes of intense fear when it is warranted, like when your child is very ill or when a fire breaks out. These frightening events trigger our biological fight-or-flight reaction, which helps us survive as a species. This response is what urges you to get medical treatment for your child or to run away from a burning building. People with panic disorder, however, experience this intense fear for no clear external reason. Repeated attacks of intense fear, often accompanied by physical symptoms. Feelings of being out of control during attacks. Constant worry about when the next attack will strike. Fearing and avoiding places where prior panic attacks have occurred. There are many different types of anxiety and anxiety disorders. Everyone is familiar with stress. Most people experience a tolerable level of stress in their daily lives, such as being overworked or sitting in traffic. It is also normal for people to experience periods of major stress throughout their lives, such as after the birth of a baby or death of a loved one. Stress can be difficult to manage. Some people find healthy ways to deal with it, like exercise, while others use alcohol and other drugs to help manage their stress. Feeling wound-up or on edge. Other types of anxiety disorders include phobias, social anxiety, and panic disorder. Panic attacks are the most severe presentation of anxiety disorders. They can be extremely debilitating and worsen other mental health issues. Panic attacks can happen to anyone, but people with panic disorder experience them repeatedly. If you or someone you love is experiencing panic attacks, panic disorder helplines can be a useful resource to get through crisis and find a treatment program. For many who experience panic attacks, it can be helpful to speak to someone who understands what they’re going through during an attack. The compassionate staff at the panic disorder hotline can provide information about what happens during an attack and provide tips to help get through the attack. This number is available to those in crisis, as well as those who are just seeking more information about the disorder. If your panic attacks are accompanied by suicidal thoughts or just a feeling of hopelessness, the National Suicide Prevention Lifeline is a free hotline open 24 hours a day, 7 days a week, to provide support for people in crisis and distress. Their national network of local crisis centers provide completely confidential guidance and can connect you to resources to help treat your panic disorder. SAMHSA’s free, 24/7 hotline provides referrals to therapists, counselors, treatment programs, and support groups in your area. They also have an online behavioral health treatment services locator, so you can find resources for yourself or a loved one who struggles with panic disorder. The NAMI Helpline is available Monday through Friday, 10 a.m. to 6 p.m. EST. Helpline staff and volunteers are there to answer your questions about panic attacks and other mental health issues. They can answer questions about local services and support groups and refer you to a crisis helpline if needed. Coping with panic attacks can be especially difficult for teenagers, who face a unique set of stressors in school and at home. 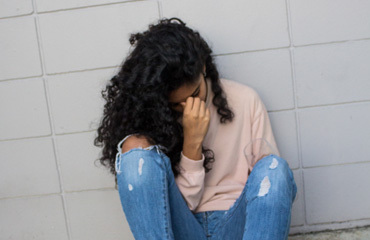 This helpline allows teens in crisis to connect with other teens who understand what they’re going through. The service can also be reached by texting “TEEN” to 839863. National Institute of Mental Health. (2016). Anxiety Disorders. National Institute of Mental Health. (2016). Panic Disorder: When Fear Overwhelms. What Does Panic Feel Like? What Am I Supposed To Do With A Hypochondriac Step Daughter? How Can I Overcome My Debilitating Shyness And Fear Of Life? Do I Have Just Social Anxiety Or Other Diagnoses Combined With SA? Are Personality Disorders For Life? Anxiety Disorder Vs. Personality Disorder: Differences? I Have OCD. Will This Increase My Child's Chance Of Developing Autism? Why Can't I Get Gross Images Out Of My Head? National Debt, Stress And Perception, Is It Really That Bad? Our Anxiety Disorders Topic Center Has Been Updated! Therapy For Borderline Personality Disorder - Building A Life Instead Of Digging Up The Past? Psychotherapy And Murder In New York: Should We All Stay Home?